Kentucky, which is ranked 35th in the nation, is far and away the largest holdout among the states that have yet to approve charter school legislation. At 685,000 students, we have more students in our public schools than the next two states combined (Nebraska and West Virginia). Our largest district, Jefferson County Public Schools (JCPS), has as many students enrolled in its schools (101,000) as does the entire state of North Dakota. The second largest district in Kentucky is Fayette County, with around 40,000 students. These two counties alone equate to about the size of the entire state of Montana, which makes Kentucky public schools low-hanging fruit for education reformers. 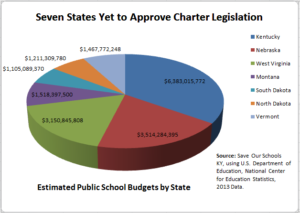 Public charter schools divert tax dollars away from existing schools and programs and hand them over to non-profits to run without direct supervision or oversight by the school board. So there are a lot of reasons why privatizers would want to set up camp in our state. $6.4 Billion of them, to be exact. Nebraska is ranked 18th in the nation. They are well ahead of the game when it comes to building a strong defense. Organizations such as Nebraska Loves Public Schools has been able to provide some very compelling material in support of public schools in their state. Their largest district, Omaha Public Schools, is a district of choice with select magnet offerings and a complex busing system, and they also serve a high-poverty and high minority population, very similar to ours in Louisville. West Virginia is ranked 20th in the nation. Montana is ranked 25th in the nation. South Dakota, ranked 41st in the nation, does allow charter schools that serve only American Indian students from federally recognized tribes if the state receives a federal grant. North Dakota is ranked 16th in the nation. Vermont is ranked 6th in the nation.